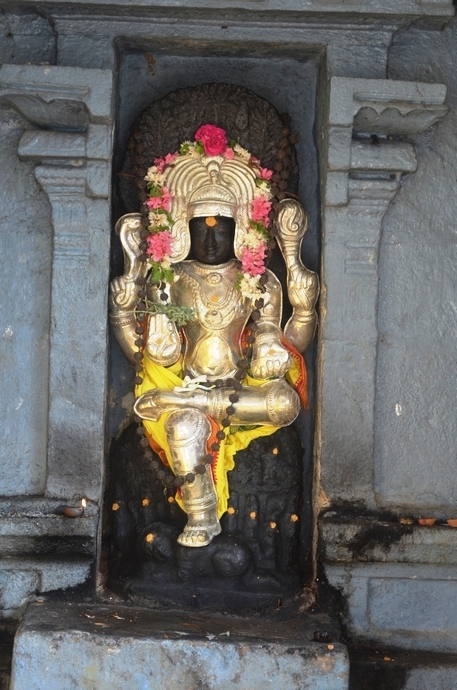 Photos taken on Thursday (12 March 2015) at Srimatam camp in Shivaasthanam. 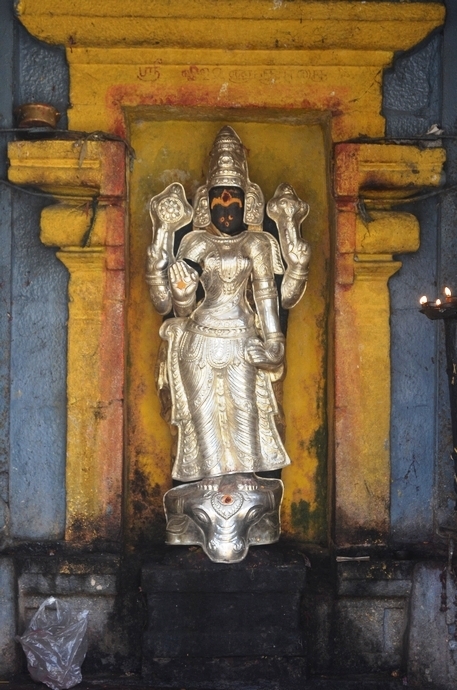 Being Thursday, Sri Ananda Dakshinamurthy and Sri Vishnu Durgai were adorned with Silver Kavacham. 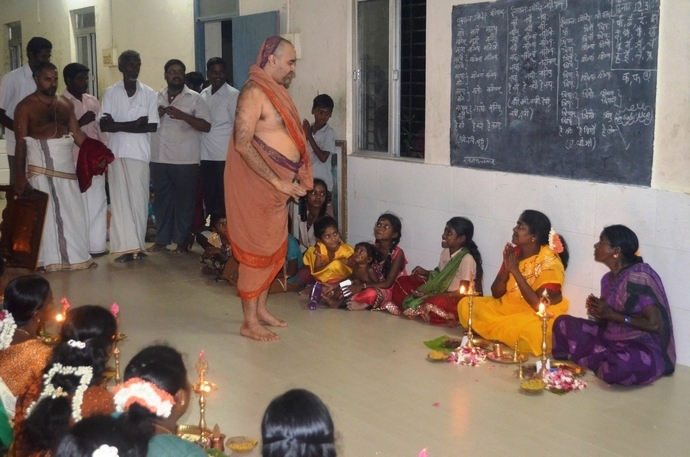 Women from in and around the Shivaasthanam in Thenambakkam performed Deepa Puja (Tiruvilakku Puja) at the camp. HH Pujyashri Shankara Vijayendra Saraswathi Shankaracharya Swamiji blessed the gathering with Anugraha Bhashanam. 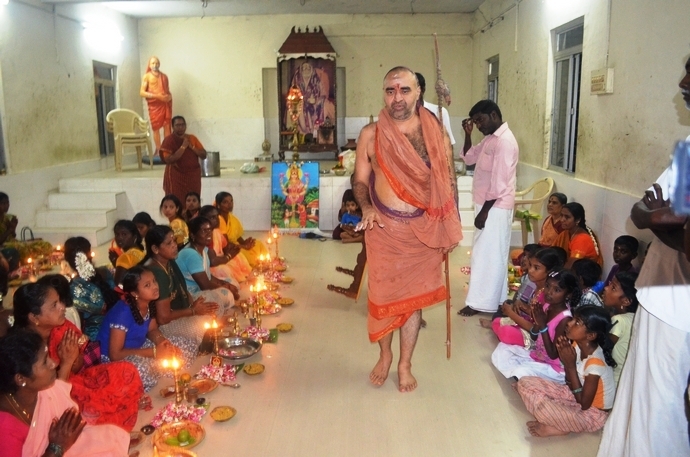 Pujyashri Acharya Swamiji told the importance of this Kshetra - and how the residents were blessed to live in a Kshetra where Srishtikarta Brahma himself stayed during the Yagnya in Kanchi, and where HH Pujyashri Chandrasekharendra Saraswathi Mahaswamiji spent a few years in vrata. His Holiness also mentioned that similar to the Prayag from where Brahma had come which is the confluence of Ganga-Yamuna-Saraswati rivers, there is a confluence of the Vegavati-Cheyyar-Palar rivers in a nearby place called Tirumukkoodal, where a Perumal temple is located. 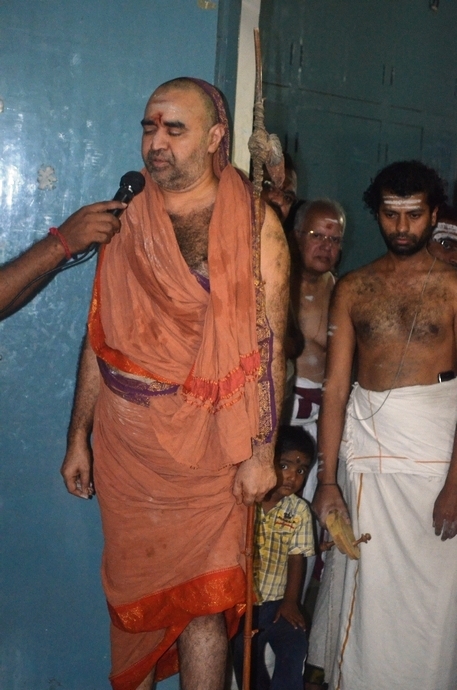 Explaining the connect between Tenambakkam and Prayag, His Holiness mentioned that a sahasralinga was made in the Shivaasthanam with the veda mantras being chanted during its making, and this linga was taken to Satara, where HH Pujyashri Mahaswamiji performed abhishekam to it, and finally, the Sahasralingam was installed and consecrated in the temple constructed by His Holiness in Prayaag.